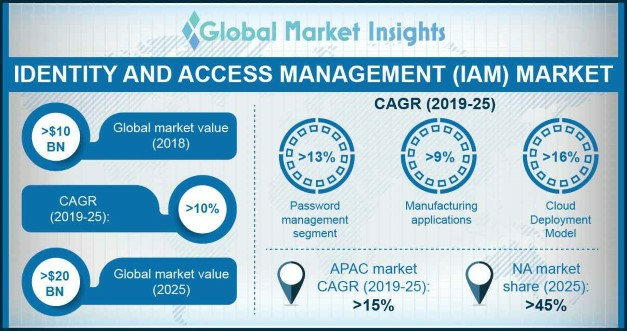 Manufacturing « Global Market Insights, Inc.
A robust increase in the adoption of advanced technologies such as cloud computing and IoT will drive the identity and access management market in the upcoming years. IAM apparently makes businesses more agile, efficient and scalable, and also offers them considerable benefits such as reduced risk of data breaches, centralized access control, ensured regulatory compliance, improved user experience, and a significant reduction in IT costs. This has quite overtly led to a spurt in investments in IAM market from venture capitalists and enterprise organizations. IAM industry has also received a considerable boost from robust investments in new artificial intelligence and machine learning solutions that are being undertaken for managing the rapid proliferation of identities and achieving least privileged access. For instance, recently Google established a collaboration with Facebook to develop their artificial intelligence to offer users a much better work experience. Proliferation of workplace mobility is a major factor that would propel identity and access management market. Global acceptance of workplace mobility by businesses has empowered employees to work from anywhere, at any time and from any device. As per sources, by 2020, mobile workforce will reach to about 105.4 million people, that translates to roughly 72.3% of the total workforce in the U.S. On a global scale, the number is set to reach 1.87 billion by 2020, or 42.5% of the worldwide workforce. These statistics provide vital evidence to the fact that identity and access management market share is likely to soar in the years to come. The Internet of Things has already redefined the concept of identity management. As IoT moves beyond consumer mainstream wearables and into massive enterprise deployments, IT teams are paying more attention towards securing access to the networks that connect to valuable products, including smart grid hardware, factory equipment, and more. IAM and privileged access management (PAM) demands are expected to become more complicated, with tougher obstacles and exponentially more endpoints. In consequence, the requirement of a strong IAM solution would become more commonplace, thereby augmenting the overall IAM industry. The rapidly escalating growth in the telecom & IT sector is certain to impel identity and access management market. As the IT & telecom industry works with a large user base, it is essential for the service providers to maintain the security of the sensitive user data. According to a survey by The Communications Fraud Control Association (CFCA), the telecommunications industry experienced $38.1 billion in fraudulent charges in 2016. As per CFCA, cyber fraudsters are seemingly working to develop new ways to siphon money from renowned, well-established organizations of various sectors. The aforementioned survey results are a strong indicator of the fact that the IT sector will serve to be one of the most profitable growth avenues for IAM market. By implementing IAM solution business could be shielded by fraudsters and hackers, eventually saving billions in remuneration for organizations. According to Global Market Insights, Inc., identity and access management market size from IT and telecom applications was worth USD 1,420 million in 2017 and is expected to register a commendable growth rate over the ensuing years. North America is undoubtedly one of the most crucial regional generators for identity and access management market. In 2017, North America accounted for a mammoth 46% of the overall industry share, primarily on account of the changing workforce requirements and the surging adoption of cloud applications and BYOD. The U.S. the most dominant regional ground for North America IAM market, given that security is the foremost crucial parameter for the plethora of companies in the country. North America IAM market has also received a considerable boost owing to the presence of a stringent regulatory landscape in the region. The continent is known to face periodic cybersecurity thefts – in 2017 alone, the average cost of a data breach was around USD 117,000 for SMEs and USD 1.3 million for large enterprises. On these grounds, the regional governments have undertaken stringent initiatives and invested extensively to come up with highly secure systems to protect user data, thereby propelling North America IAM industry share. Some of the most prominent contenders in the global identity and access management market include IBM Corporation, SailPoint Technologies Holdings, Inc., Okta, Inc., Symantec, Gemalto, Crossmatch, Oracle, HID Global Corporation, CA Technologies, OneLogin, Inc., OpenText Corp., Ping Identity, ForgeRock, Net IQ, and Dell, Inc. These companies are often found conducting mergers and acquisitions to increase their business reach and expand their customer base. For instance, Marsh, a global leader in insurance broking and innovative risk management solutions, recently announced a collaboration with IBM Corp. to provide clients with a wider access to blockchain solution for ensuring proof of insurance. IAM solutions have proven to be effective in reducing challenges faced by organizations with regard to security and privacy such as data loss, data leakage, insecure usage, and insider attacks. IAM also decreases burden on the IT departments due to its self-service functionality. Driven by the fact that IAM delivers secure ways for authentication, authorization, and management of users without compromising on convenience and usability, the global IAM market share is anticipated to grow at a CAGR of 10.4% over 2018-2024. This entry was posted in Sustainable & Smart Technologies and tagged Advanced Authentication, Audit, BFSI, Cloud, Compliance and Governance, Directory Services, Education, Healthcare, IAM Market, IAM Market Analysis, IAM Market Growth, Identity and Access Management Market, Identity and Access Management Market Forecast, Identity and Access Management Market Growth, Identity and Access Management Market Leaders, Identity and Access Management Market Share, Identity and Access Management Market Size, Identity and Access Management Market Trends, IT & Telecom, Manufacturing, On-Premise, Password Management, Provisioning, Public Sector and Utilities, Retail, Single Sign-On.